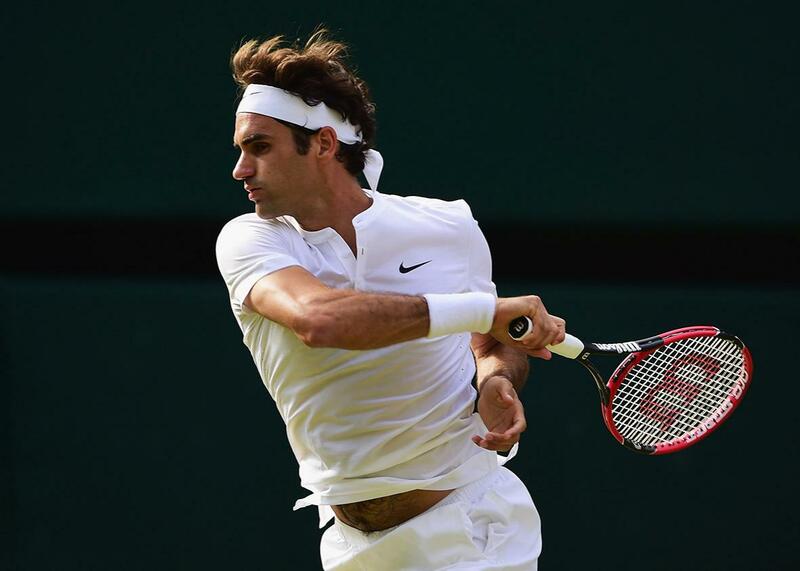 Roger Federer think piece: How to write one for the 2015 U.S. Open, or any other occasion. Roger Federer during Wimbledon on July 10, 2015 in London. In celebration of nearly a decade of Federer’s unprecedented think piece dominance, Slate is pleased to offer a complete guide to making your own contribution to the literature of Federer. You are just a few simple steps from becoming a part of history. Step 1: Open with an expansive idea. Step 2: Include some biographical info. With your big opener complete, you can now go back into Federer’s biography. He has some great quirks that, when mentioned, will add some needed heft to what is at its essence a light form. His two sets of twin children is a good one, or you could opt for his unusually fervent devotion to his wife, Mirka. (The twin twins were unborn when DFW wrote, so he made this choice, though she was then Mirka Vavrinec, his girlfriend.) The Guardian’s Julian Barnes went with a clever observation about his bad handwriting. I think you can never go wrong with his Swiss-ness, which seems somehow perpetually in evidence in his game. He is graceful, meticulous, smooth, like a watch, or a chocolate. To all outward appearances, he is politically neutral. Step 3: Get the adjectives going. Step 4: Carefully observe his recent play. This is an essential step in any Federer think piece. No literary rumination on something familiar is complete without a news peg. Here is your chance to casually introduce one, with a worm’s-eye view of the action. (Bonus: very little about singles tennis is hidden, so you can do this from the ease and comfort of your couch by just watching a TV feed.) Consider Thursday’s joyous Grantland piece by Michael Terry and Louisa Thomas, in which Federer’s quick dispatch of Richard Gasquet is called “astonishingly crisp” (nice adjective use there) and his serve-and-volley game, a tweaked addition to his already expansive repertoire, is shown to be subtly original and deft. This is textbook Federer appreciation, spotting his intuitive grasp of strategy, his joystick-like command of angles, and his understated but indefatigable will. Wallace, whose ability to paint physical movements is somehow an underrated part of his writerly repertoire, gives a stirring account of an Agassi-Federer point played in 2005. Go back and read it. It’s absolutely highlight-reel stuff. Step 5: Remark on the progression of time. There may have been an era when you could simply sit back and appreciate one of the world’s greatest athletes in his prime, but those days are gone. As Phillips recently noted, we’ve now spent at least four years appreciating Federer’s ability to last past his physical peak. And still, he is ranked No. 2 in the world, ahead of hundreds of feverishly devoted, mind-blowing athletes like Japan’s Kei Nishikori, who is certainly the best tennis player ever to come out of his country, and was an 8-year-old prodigy when Federer’s ATP career began. You must discuss age and Federer’s relationship to it. There is no way to understand him without seeing that he has achieved something singular in the bizarre world of sports, where retirement age is around 35, defying the passage of time without ever seeming to get angry with it, never yielding to the continuous challenges of people literally half his age and so exceptional at this sport that it defines their lives. Your appreciation of Roger Federer is almost complete. Is there a choice quote he’s given to the press recently, one that neatly captures the timbre of your thoughts? Some of the best pieces go this route. Tomkins ended with one; so did Terry and Thomas. Writing for the New York Times Magazine in 2013, Michael Steinberger closed with a quote from Swedish great Mats Wilander and even got the word “magical” in there. Maybe I’m old-fashioned, but I personally like to close with an image. Something that recalls Federer’s own form, placid but deceptively complex. A defensive lob, maybe, hit high by some hapless opponent too overwhelmed to put anything else on it, floating a moment before Federer obliterates it for a winner. Let it hang there, still, like Federer himself. It is good if the image is followed by a new paragraph. Bring it home with your clinching line. You’ve said everything there is to say now. All that’s left to do is point your eyes skyward and watch.